The Browns released Allen (abdomen) off of injured reserve Tuesday, Nate Ulrich of the Akron Beacon Journal reports. Analysis: Allen was waived with an injury designation earlier in August and ultimately reverted back to injured reserve. The team elected to officially cut ties with him instead, and Allen will be free to pursue other opportunities when healthy. Allen (abdomen) was waived/injured by the Browns on Saturday, Daryl Ruiter of 923thefan.com reports. 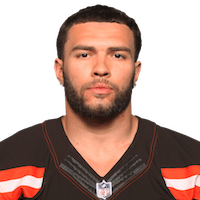 Analysis: Allen and the Browns could reach an injury settlement agreement if the tight end clears waivers, while the team was able to sign fellow tight end Stephen Baggett after waiving Allen. Allen will skip the preseason opener Thursday due to an abdominal injury, Mary Kay Cabot of The Cleveland Plain Dealerreports. Analysis: Allen hopes to remain on the roster through training camp with a strong showing in the preseason, but he's gotten off on the wrong foot with a DNP in the opener. The undrafted rookie's next opportunity to suit up for the Browns arrives a week from Friday against the Bills. There are no videos available for Julian Allen. Click here to view all videos.